The Silent Governess is a beautiful sweet Regency romance, with Christian undertones by Julie Klassen. It is reminiscent of the novels of Victoria Holt in that is has a Gothic flavour. It is expertly researched and has an ingenious and page turning plot, containing plenty of mystery and suspense pertaining to the hero and heroine including family secrets and threatening characters. I rooted for the heroine, Olivia, from the off. She is a strong and thoroughly likeable young woman who is fleeing a crime scene. Her actions greatly assist the emotional journey that the hero embarks on as he comes to terms with new found secrets from his own past. The hero, Lord Bradley, is a handsome, honourable and competent young man, however, he is very much the product of his aristocratic upbringing and his actions towards the heroine are not always kind. He did grew on me a great deal as the story progresses and he comes to learn a great deal about what really matters in life. The characterisations are excellent and the romance, central to the plot, evolves realistically, over time. Olivia is quickly attracted to her employer but Lord Bradley, although increasingly fascinated and drawn to her beauty inside and out, shies away from admitting his attraction to himself, due to the differences in their station. Yet he comes to realise that in reality there is not much that separates them after a series of unexpected plot twists. Their evolving romance is truly beautiful to behold. The read expertly illustrates the social mores of the time, including the perceived gulf between the upper classes and those in service. It is especially instructive in painting a realistic picture of the lonely life of a governess. It also documents the rural society around the great houses and the ties between the church, village and the role the aristocracy played in managing their estates. I particularly loved how each chapter has a contemporaneous quote from the era reflecting the times. This is the first book that I have read by Julie Klassen and I thoroughly enjoyed it. 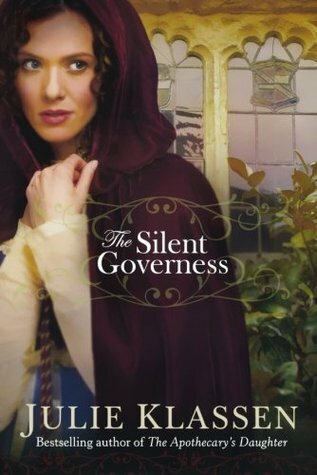 The Silent Governess transported me to the Regency era and swept me away into the emotions of the characters. I recommend it to romance lovers who like a sweet romantic read. This entry was posted in Historical, REVIEWS (ALL) - Reverse Chronological Order, Romance and tagged christian-read, historical-romance, inspirational-read, regency-romance, romance, the-silent-governess.